So what do you think is going on here? Remember that the image is a 1:1 reproduction magnified 1.6 times due to the cropped sensor of my camera and further magnified x times by me cropping the original image. When I spotted this, all I could see was an ant which seemed to have a stick attached to it and glided along the stem of this of grass! It was only on looking closer – very much closer! – that I realised that the “stick” was actually a spider!. I guess it has adapted itself to mimic a stick. 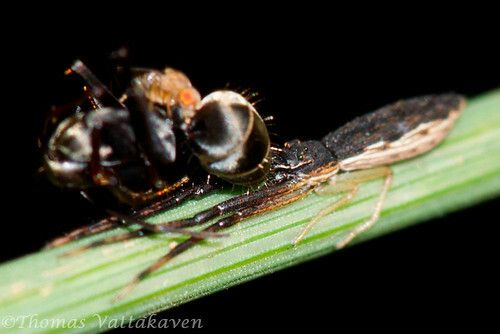 The spider appeared to have fooled not just me, clearly it had fooled this ant, which ended up being its prey. But, hang on, there’s more going on….there seemed to be a blob of colour on the ant. 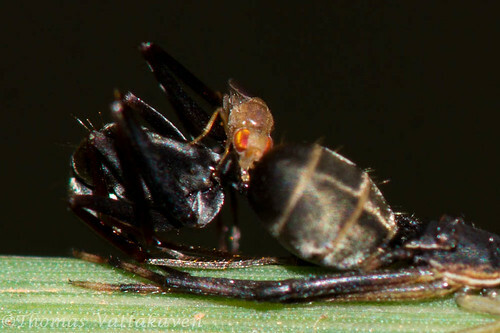 I backed out and focussed on the blob to reveal a fly sitting on the dead ant! To me the fly looks very similar to a fruit-fly but perhaps this is a related species which fancies more of a non-vegetarian diet. 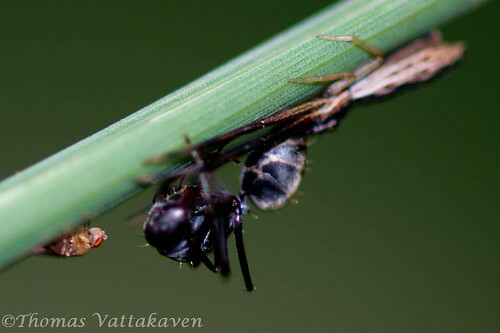 The ant appears to be one of the Polyrhachis species. The question is, what really is going on here? 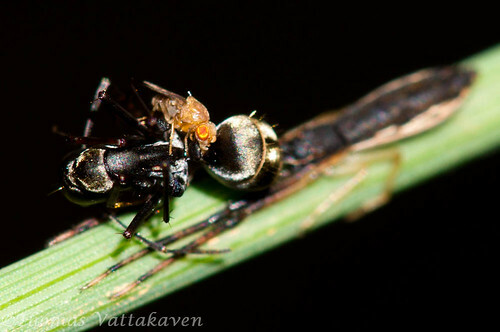 What is the fly doing on a dead ant that clearly is the spiders meal? I`m not sure, but I can make a few guesses. A) the fly was passing by and spotted an easy meal and decided to stop by. 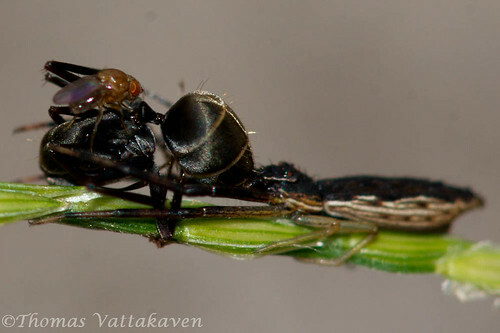 B) far more likely is that the fly is laying eggs on the ant. 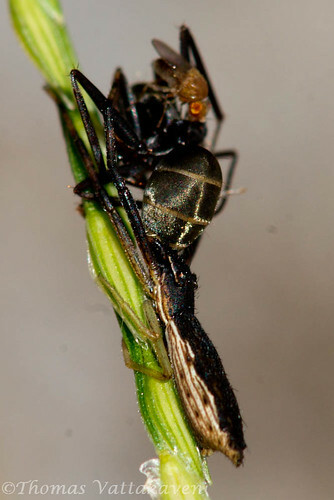 Once the spider is done sucking out the innards of the ant, it will dispose of the outer skeleton containing the fly’s egg. When the egg hatches, perhaps it can feed off what’s left of the ant? Perhaps one some of the readers of this blog have an alternative explanation? If so do leave a comment below. 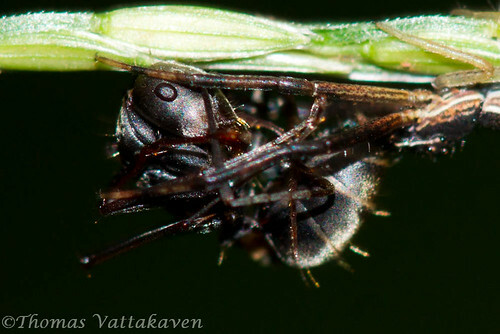 Labels: action series, Ants, Fly, Insect, Karimannoor, Kerala, Macro, Spider, What's happening here? Wow, its the first time I'm seeing two such creatures share a meal. Captured the moment wonderfully Tom!